The Equipe Classic Relay is a unique event. The three hour race is for teams of two to four cars with one car on track at any time so team strategy and car/driver changes can play a big part. A handicap system ensures an exciting and close finish for all classes of car and team. Long distance team races have a unique atmosphere and camaraderie. 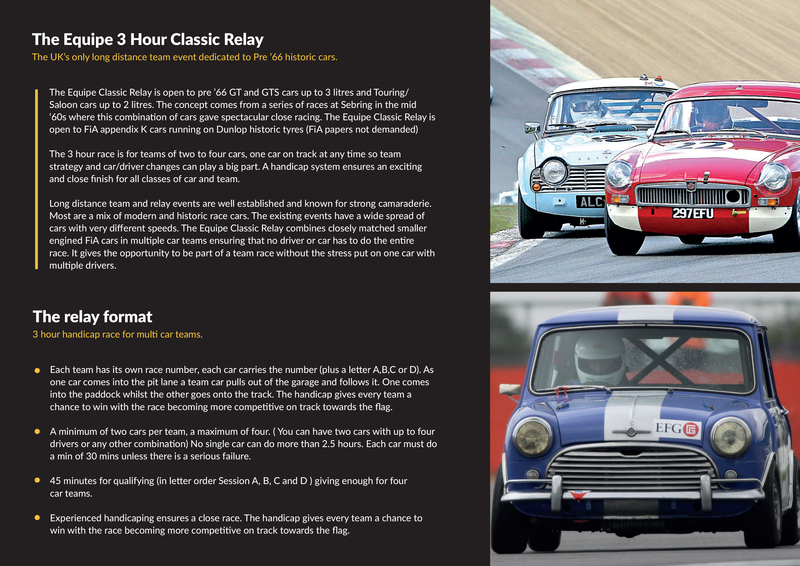 The Equipe Classic Relay is the UK’s only long distance team event dedicated to historic cars. Multiple car teams ensure that no driver or car has to do the entire race giving drivers the opportunity to be part of a team without the stress put on any single car. The event is open to pre 1966 GT & GTS cars running to FiA appendix K specification, FiA papers are welcome but not mandatory.